Reader Dave Mitchell of South Africa never has it easy. For him, doing genealogy isn’t just going to a courthouse across the country where he lives to look at records. It’s a matter of figuring out the laws half a world away. 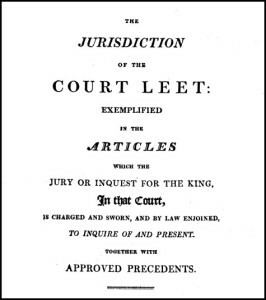 So, he asks what, in 1716 Northern Ireland, was a court-leet? Wow. That doesn’t help much either, does it? Nobody’s speaking English here! So let’s try it more simply. There were a lot of things that needed to be done to run a place like a lordship or a manor. Some of them required assembling everybody who lived there. And sometimes it was just easier to set a day (or days4) aside for doing things like collecting rents, having the peasants swear loyalty to the king and generally taking stock of how things were going. And the way things were set up, there was this system called frank-pledge, where all the regular folk who lived in a place were answerable for what everyone else who lived there did.5 You can think of it as a kind of organized system of tattle-taling, since it encouraged people to rat each other out. Not so much for big crimes, mind you, but for all the little niggling things like not keeping the road repaired, or not using proper weights and measures. Most of these things didn’t take a formal court with judges and lawyers and serious penalties. So they were handled by somebody appointed by the lord of the place, like his steward. Big crimes were reported there, but then kicked upstairs to those formal courts. It was up to the steward — usually through a bailiff — to give notice to those who had to be there. 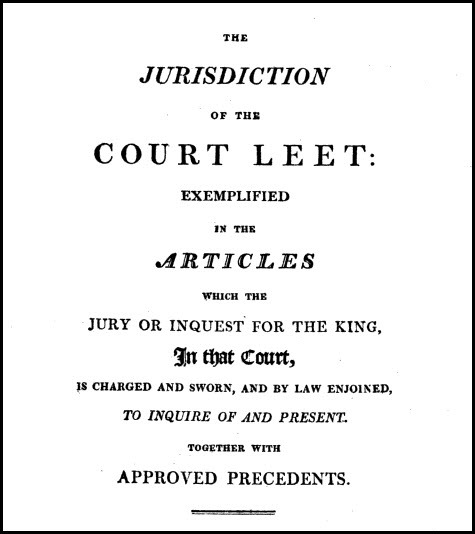 And that’s why Dave’s family member David Mitchell of Killomalagh was “summoned to appear at a Court leet.” That didn’t mean he’d done anything he had to answer for; it meant he lived there and everybody who lived there had to show up.